-- Because he wasn't peeling well! So says Joshua in his first stand up joke. Nothing much to say except I'm out for two days (including today) for an offsite work thingie. Miss the kids, miss the hubby. Been inactive for the past three days, by choice. I've caught up in my reading, the hubby was sick and other things that needed doing. Thank goodness for wireless connection in my hotel room. Hope to catch up with you guys soon. On a very rainy Friday night last week, the hubby and I decided to hold off fighting the traffic on the way home and have dinner. Off we headed to High Street, where we spent a few minutes browsing through the stores (he browsed, I bought crocs for Josh) then went to this quaint little restaurant that's famous for its pastries -- ensaymadas and the softest cheese roll you've ever tasted. It was a beautiful night despite the rain. I could feel the stress of the week draining away as we sat at our table enjoying steaming plates of pasta and just quietly talking. It's a relief to be in a restaurant where you don't have trouble having a conversation. In the picture you'll see what I had for dessert. 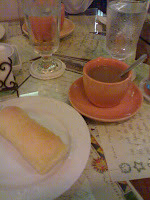 The cheese roll, of course, and a cup of steaming Mint Hot Chocolate. Perfect for a cold rainy night. Hokay. Knee taken care of. Still feeling a bit tender but nothing to complain about. Don't look if you're squeamish. Have I mentioned how I HATE needles? We went through several stops and starts before the doctor was finally able to stick the needle in. I kept yelling, "wait, wait, wait!" every time he was about to start. It wasn't too terrible, really. Just a sting from the humongous needle and pressure once it was in. Still, I hummed, drummed my fingers on my chest, clutched the hubby's fingers and blurting out an occasional OW! when the pressure got a bit too much. The hubby refused to look. I tell him to take a picture. Now???!! !, he says. No, in the middle of it, and only if I'm not screaming in pain, I said. Anyway, knee feels loads better though now I can feel the injury. Nothing broken showed up in the xray so now I'm thinking, what am I going to do about it? I'll be seeing a doctor tomorrow about my left knee. 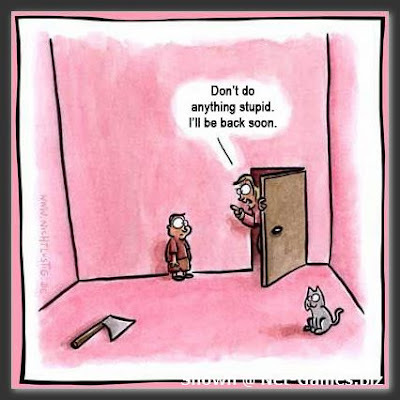 The hubby's getting upset that I've kept postponing the check-up for three weeks already. I don't really remember how I hurt it but I'm thinking now that it must have happened during boxing. Anyway, I can still walk and everything but it hurts when I straighten it and put my weight on it. I can feel a strong twinge of pain when I go up and down stairs. And it was hurting yesterday after I drove a manual transmission. That's number one agenda early tomorrow morning. Then we have a birthday party at 2:30 and a dinner party at 7. It's going to be a busy weekend but the prospect of a grown up party with just the hubby and me is enough to perk me up. But first, I've got to wade through Friday night traffic. Not fun. So have a good one folks. Whatever you've got planned this weekend. My daughter Faith hasn't been able to pronounce the letter F.
So everything F becomes a P.
Her name is "Pait" (can't pronounce the th either). She hurt her "poot" (foot). It drove her older brother crazy! Josh: Not P!!! F!! Ffffffffffff. Faith! So I am very happy to share that she can now pronounce her name properly. I knew it was only a matter of time. And she's very proud of herself too! Me: Very good! Ok, Faith, say Elffffff. Me: Ok, which dvd do you want to watch? Nemo? Lion King? Cinderella? Happy Feet? 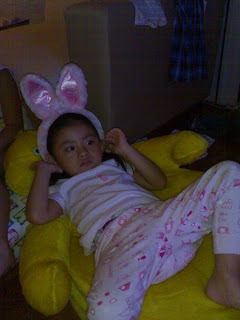 Faith: I want to watch Haffy Feet!!! Anxious about Joshua's 1st quarter evaluations. In the middle of Stephenie Meyer's Eclipse.